Vacuum unit mounts and locks to cart for stability, and may be quickly removed for everyday maintenance. 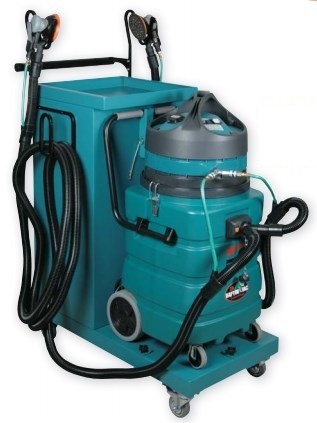 Tools, vacuum hoses, air lines and electric cord mount directly to cart, for convenient accessibility. Tools and accessories sold separately. Includes four shelves for handy storage of tools, accessories, abrasives and more. Shelves are protected by lockable door for added security. Top of cart may be utilized as additional shelf for tools, accessories, etc. Cart comes equipped with easy-glide steering casters to effortlessly transport vacuum unit, even on irregular surfaces. Cart also accepts optional Division 2 Vacuums (pages 6-7). Shipping weight of Cart alone is 191 pounds (87 kg).